3 Shared code 42 with Czech Republic until 1997. Slovakia ( Slovak: Slovensko) is a landlocked republic in Central Europe with a population of over five million. It is a member of the European Union (since May 1, 2004) and borders Czech Republic and Austria in the west, Poland in the north, Ukraine in the east and Hungary in the south. 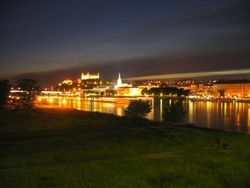 The largest city is its capital, Bratislava. The longer form of the name Slovakia is Slovak Republic ( Slovak: Slovenská republika). The relation between those two name forms is exactly the same as with for example Germany vs. Federal Republic of Germany or France vs. French Republic. The latest practice, often seen especially in economic texts, of using the name Slovak Republic instead of Slovakia, when the terms Hungary, Slovenia, etc. are used in the same text, is therefore awkward, arising in analogy to the use of the term Czech Republic, but that is (partly) another problem (see Czech Republic, Czech lands). From around 450 BC, the territory of modern-day Slovakia was settled by Celts, who built powerful oppida in Bratislava and Liptov. Silver coins with the names of Celtic kings represent the first known use of writing in Slovakia. From 6 AD, the expanding Roman Empire established and maintained a chain of outposts around the Danube. The Kingdom of Vannius, a barbarian kingdom founded by the Germanic tribe of Quadi, existed in western and central Slovakia from 20 to 50 AD. The Slavic population settled in the territory of Slovakia in the 5th century. Western Slovakia was the centre of Samo's Empire in the 7th century. A proto-Slovak state, known as the Principality of Nitra, arose in the 8th century and its ruler Pribina had the first Christian church in Slovakia consecrated by 828. Together with neighboring Moravia, the principality formed the core of the Great Moravian Empire from 833. The high point of this (Proto-) Slovak empire came with the arrival of Saints Cyril and Methodius in 863, during the reign of Prince Rastislav, and the territorial expansion under King Svätopluk. After the disintegration of the Great Moravian Empire in the early 10th century, the Magyars gradually occupied the territory of the present-day Slovakia. Because of its high level of economic and cultural development, Slovakia also retained its important position in this new state. For almost two centuries, it was ruled autonomously as the Principality of Nitra, within the Kingdom of Hungary. Slovak settlements extended to the northern half of present-day Hungary, while Hungarians later settled down in the southern part of Slovakia. The ethnic composition became more diverse with the arrival of the Carpathian Germans (from the 13th century), Vlachs (from the 14th century), and Jews. A huge population loss resulted from the invasion of the Mongols in 1241 and the subsequent famine. 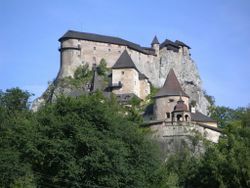 However, medieval Slovakia was characterized rather by burgeoning towns, construction of numerous stone castles, and the development of art. In 1467, Matthias Corvinus founded the first university in Bratislava, but the institution was short-lived. After the Ottoman Empire started its expansion into present-day Hungary and the occupation of Buda in the early 16th century, the centre of the Kingdom of Hungary (under the name of Royal Hungary) shifted towards Slovakia, and Bratislava (known as Pressburg, Pressporek, Posonium or Posony at that time) became the capital city of the Royal Hungary in 1536. But the Ottoman wars and frequent insurrections against the Habsburg Monarchy also inflicted a great deal of destruction, especially in rural areas. 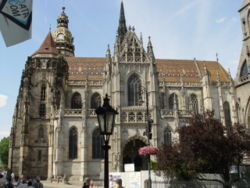 As the Turks retreated from Hungary in the 18th century, Slovakia's influence decreased within the kingdom, although Bratislva retained its position of the capital city of Hungary until 1848, when the capital moved to Budapest. During the revolution in 1848-49, the Slovaks supported the Austrian Emperor, with the ambition to secede from the Hungarian part of the Austrian monarchy. But they failed in the end to achieve this aim. During the period of the Austro-Hungarian Empire, from 1867 to 1918, the Slovaks experienced severe oppression in the form of Magyarisation promoted by the Hungarian government. For example, all three Slovak high schools and Matica slovenská were closed down in 1874-1875. In 1918, Slovakia joined the regions of Bohemia and neighbouring Moravia to form Czechoslovakia. During the chaos following the breakup of Austria-Hungary, Slovakia was in 1919 attacked by the provisional Hungarian Soviet Republic and 1/3 area of Slovakia temporarily became the Slovak Soviet Republic. During the Interwar period, democratic and prosperous Czechoslovakia was permanently threatened by revisionist governments of Germany and Hungary, until it was finally broken up by the Munich Agreement of 1938, when Slovakia became a separate state with a Nazi Germany sympathizing government (in lead with president Jozef Tiso). However, the anti-Nazi resistance movement launched a fierce armed insurrection, known as the Slovak National Uprising, in 1944. After World War II, Czechoslovakia was reassembled and came under the influence of the Soviet Union and its Warsaw Pact from 1945 onward. In 1969, the state became a federation of the Czech Socialist Republic and the Slovak Socialist Republic. The end of communist rule in Czechoslovakia in 1989, during the peaceful Velvet Revolution, was followed once again by the country's dissolution, this time into two successor states. Slovakia and the Czech Republic went their separate ways after January 1, 1993, an event sometimes called the Velvet Divorce, but Slovakia has remained close partners with the Czech Republic, as well as with other Central European countries within the Visegrad Group. Slovakia became a member of the European Union in May 2004. 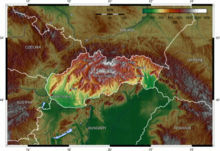 The Slovak landscape is noted primarily for its mountainous nature, with the Carpathian Mountains extending across most of the northern half of the country. Amongst them are the high peaks of the Tatra mountains, where the High Tatras are a popular skiing destination and home to many scenic lakes and valleys as well as the highest point in Slovakia, the Gerlachovský štít at 2,655 metres (8,711 ft). Major Slovak rivers, besides the Danube, are the Váh and the Hron. The Slovak climate is temperate, with relatively warm summers and cold, cloudy and humid winters. The majority of the inhabitants of Slovakia are ethnically Slovak (86%). Hungarians are the largest ethnic minority (9.7%) and are concentrated in the southern and eastern regions of the country. Several municipalities, Dunajská Streda, Komárno, Šahy, Želiezovce etc., have a Hungarian majority. Other ethnic groups include Roma, Czechs, Ruthenians, Ukrainians and Germans. The percentage of Roma is 1.7% according to the last census (that is based on their own definition of the Roma), but around 5.6% based on interviews with municipality representatives and mayors (that is based on the definition of the remaining population). Note however that in the case of the 5.6%, the above percentages of Hungarians and Slovaks are lower by 4 %age points in sum. The Slovak constitution guarantees freedom of religion. The majority of Slovak citizens (68.9 %) identify themselves with the Roman Catholicism (although church attendance is lower); the second-largest group are people without confession (13%). About 6.93% belong to Lutheranism and 4.1% are Greek Catholic, Calvinism has 2.0%, other and non-registered churches 1.1% i.e., other Eastern Catholic and some 0.9% are Eastern Orthodox. It is estimated that there are about 5,000 Muslims in Slovakia. About 2,300 Jews remain of the large estimated pre-WWII population of 120,000. The official state language is Slovak, a member of the Slavic languages, but Hungarian is also widely spoken in the south of the country and enjoys a co-official status in some (southern) regions of Slovakia. In 2004 Slovakia had a fertility rate of 1.25 (i.e., the average woman will have 1.25 children in her lifetime), which is one of the lowest numbers among EU countries. The fertility rate is currently increasing again. 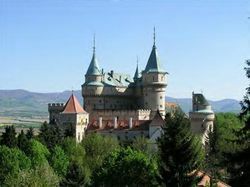 Bojnice Castle, the only one of its design in Central Europe. Slovakia is a parliamentary democratic republic with a multi-party system. The last parliamentary elections were held on June 17, 2006 and two rounds of presidential elections took place on April 3, 2004 and April 17, 2004. The Slovak head of state is the president ( Ivan Gašparovič, 2004 - 2009), elected by direct popular vote for a five-year term. Most executive power lies with the head of government, the prime minister ( Róbert Fico, 2006 - 2010), who is usually the leader of the winning party, but he/she needs to form a majority coalition in the parliament. The prime minister is appointed by the president. The remainder of the cabinet is appointed by the president on the recommendation of the prime minister. Slovakia's highest legislative body is the 150-seat unicameral National Council of the Slovak Republic (Národná rada Slovenskej republiky). Delegates are elected for a four-year term on the basis of proportional representation. Slovakia's highest judicial body is the Constitutional Court (Ústavný súd), which rules on constitutional issues. The 13 members of this court are appointed by the president from a slate of candidates nominated by parliament. Slovakia is a member state of the European Union since May 1, 2004 and of NATO since March 29, 2004. As a member of the United Nations (since 1993), Slovakia was, on October 10, 2005, for the first time elected to a two-year term on the UN Security Council (for 2006-2007). Slovakia is also a member of WTO, OECD, OSCE, and other international organizations. As for administrative division, Slovakia is subdivided into 8 kraje (singular - kraj, usually translated as regions, but actually meaning rather county), each of which is named after its principal city. Regions enjoy a certain degree of autonomy since 2002. Their self-governing bodies are referred to as Self-governing (or autonomous) Regions (sg. samosprávny kraj, pl. samosprávne kraje) or Upper-Tier Territorial Units (sg. vyšší územný celok, pl. vyššie územné celky, abbr. VÚC). In terms of economics and unemployment rate, the western regions are richer than eastern regions; the relative difference is not bigger however than in most EU countries having regional differences. Slovakia has mastered much of the difficult transition from a centrally planned economy to a modern market economy. The Slovak government made progress in 2001 in macroeconomic stabilization and structural reform. Major privatizations are nearly complete, the banking sector is almost completely in foreign hands, and foreign investment has picked up. Slovakia's economy exceeded expectations in the early 2000s, despite recession in key export markets. Solid domestic demand boosted economic growth to 4.1% in 2002. Strong export growth, in turn, pushed economic growth to a still-strong 4.2% in 2003 and 5.4% in 2004, despite a downturn in household consumption. Multiple reasons entailed a GDP growth of 6% in 2005, the 4th highest rate in the EU (after the three Baltic states). The GDP growth is expected to reach at least 7.7% in 2006 (the year-to-year growth amounted to unexpected 9.8% in the 3th quarter, which helped to increase the overall year economy growth expectation to 7.7%), and 6.5% in 2007. The 9.8% growth came as a surprise to local analysts (6 % were expected), given that the big foreign investor Kia is going to launch its production only in late 2006. Unemployment, rising from 14.9 % at the end of 1998 to 19.2% at the end of 2001 (seasonally adjusted harmonised rate) during the radical reforms introduced by the Slovak government since 1999, decreased again to some 12% (autumn 2006), but still remains among the highest ones in the EU. Inflation dropped from an average annual rate of 12.0% in 2000 to just 3.3% in the election year 2002, but it rose again in 2003-2004 because of increases in taxes and regulated prices. It reached 3,7 % in 2005. Slovakia plans to adopt the Euro currency on 1 January 2009 and has already entered the ERM II for this purpose ( Slovak euro coins). Slovakia is among the most attractive countries in the EU for foreign investors mainly because of its low labour costs (a 2005 survey by the prominent consultant firm Deloitte shows that Slovakia has the lowest labour costs in the European Union) and low tax rates. This issue has sparked criticism from some other EU countries, which accuse Slovak government of social and tax dumping. In recent years, Slovakia has been pursuing a policy of encouraging foreign investment. However, that has not shown any benefits so far in innovation capabilities within the country. Despite a sufficient number of researchers and a solid secondary educational system, Slovakia (as well as some other post-communist countries) still face many challenges in the field of modern knowledge economy. Within the EU, Slovakia ranks next to last on knowledge creation and last for innovation and entrepreneurship. The business and public R&D expenditures are deeply below EU average. World Bank urges Slovakia to upgrade information infrastructure and reform education system, OECD states that a stronger product market competition would help. Because it is in middle Europe and has been inhabited for a relatively long time, Slovakia features interesting natural landscapes, mountains, deep caves, medieval castles and cities, folk architecture and ski resorts.